Retrocommissioning (RCx) is rapidly growing in popularity as a tool to cost effectively reduce energy use in existing buildings. A recent study by Lawrence Berkeley National Lab showed that commissioning existing buildings yields significant energy savings and can provide a substantial return on investment. Utility programs are embracing the concept and taking a variety of approaches to helping their customers find providers and engage in an RCx process. Done right, RCx can provide deep and lasting savings within a facility. Unfortunately many projects look to shortcut the process. Focusing on the Investigate and Implement facets of the process may seem to be the shortest route to garnering savings, but it may result in comfort problems, dissatisfied employees, and measures overridden by maintenance personnel, resulting in the owner’s investment not yielding sustained benefits. I’m going to review each facet of the process and explain why it is critical to the success of your RCx project. Cx Associates has worked on several RCx projects where the operations and maintenance staff are not on board. The building owner looks to the RCx provider to somehow garner the support of these individuals who have a variety of barriers to the process. Without the commitment of the organization, from top to bottom, a comprehensive RCx process is likely to fail. In most cases RCx providers have engineering backgrounds and do not tend to have the skills to address organizational resistance to the process. Are there enough savings opportunities in this facility to support RCx? If so, where are those opportunities? What are the requirements for a successful RCx project? Once those questions are answered, the RCx provider can develop a plan of attack for the investigation phase. This includes reviewing the building documentation, on-site time verifying control sequences and identifying opportunities, as well as office time estimating savings and the costs of implementation, commissioning, training, and verification. These steps go hand in hand – commissioning should not be viewed as an after the fact part of the process, but it is an essential facet of the process. Implementation includes designing and specifying the measures, contracting and installation. The commissioning process includes review of the contractor proposals to ensure the key aspects of the project are understood, verifying installation, and testing for performance before the contractors receive their final payment. Ensure all of the changes are documented in the facility records. Clear operating sequences that are understandable to maintenance staff should be posted in mechanical rooms. DDC graphics must be updated and verified and include a link to the sequences of operations. If the operators don’t understand the concepts behind the system optimization improvements they will override them. Training needs to be extensive enough to address knowledge gaps in the concepts as well as their execution by operations and maintenance staff. In addition, the end users should understand what to expect and how to report issues. Most building projects are an open loop. Closing the loop and verifying that the project goals are met is essential to improving practice overall. Verify energy savings, comfort, maintenance practices and costs and provide a feedback loop to the parties involved in the project so that the next project will be even better. 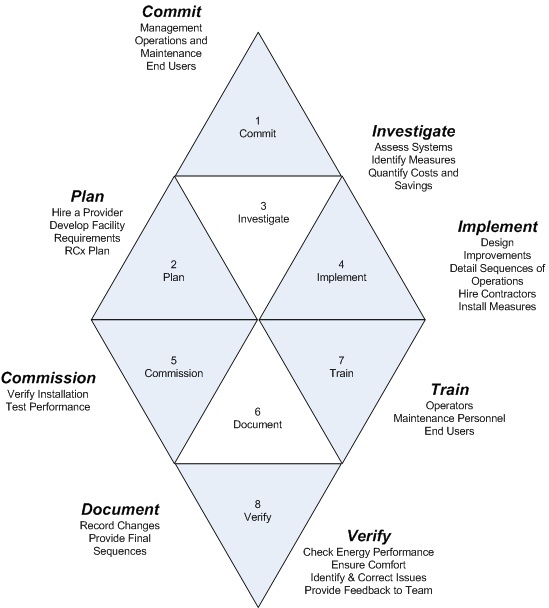 Following all of these steps will reveal the true benefits of the retrocommissioning gem. In future blog posts I will explore barriers we encounter to each facet and the practices we are developing to help address them.